Serving Spain’s third largest city, Valencia Airport operates routes to numerous European destinations. Browse our Valencia Airport guide for contact details, information on transportation and hotels, and details of terminal facilities. There are information desks (tel: +34 913 211 000) centrally located on the ground and first floors of the terminal building. A tourist information office (tel: +34 961 525 792), on the ground floor, can provide information on the local area. Valencia Airport is located to the west of Valencia, in the municipalities of Manises and Quart de Poblet. National road N-220, which connects with the westbound A-3 and northbound V-30 from Valencia, leads to the airport. Bus: Local bus 150, operated by the metropolitan transport authorities (tel: +34 96 315 8515; www.emtvalencia.es), runs between the airport and the central bus station from 0525 to 2355 (journey time: 45 minutes). Taxi: Taxis can be picked up in the area just opposite the arrivals hall. Companies serving the airport include Radio Taxi Valencia (tel: +34 963 703 333), Taxco (tel: +34 902 024 972) and Taxis de Valencia (tel: +34 961 119 977). Fares from the airport are subject to a supplement. Metro:The Valencia Metro (tel: +34 900 461 046; www.metrovalencia.es) links the airport with the centre of Valencia and port area. The journey time on Line 3 takes around 25 minutes.The station is on the ground floor of the regional flights terminal and there is also an information office in the arrivals hall. There are ATMs on the ground and first floors of the terminal. Currency exchange facilities are also located within the terminal building. Valencia Airport has a good selection of cafés and several restaurants. Among these is Tribs, which offers fine dining based on Iberian cuisine, and La Pausa grill restaurant. There is a range of shops airside selling food, gifts, fashion and accessories. Additionally, the delicatessen Thinking Valencia offers specialist local foodstuffs and other giftware. In the public area, there is a pharmacy and a newsagents'. Queries regarding lost possessions should be directed to the lost and found office (tel: +34 961 598 674) or the relevant airline counter on the ground floor of the terminal. There is a specific service for lost or damaged baggage located in the baggage reclaim lounge (tel: +34 961 522 737; email: vlcfxh@groundforce.com). A luggage wrapping machine is also available on the first floor at check-in. Other facilities available at Valencia Airport include first aid services, available on the ground floor. A VIP lounge (tel: +34 961 598 888) is available at Valencia Airport, which has free Wi-Fi access and can be used for small business meetings. Additionally, the on-site Rafael Martínez Esteve Conference Room (tel: +34 961 598 509) has a capacity for up to 80 people and can be divided into two spaces. There is also a multipurpose room with capacity for 50 people. Wi-Fi internet access is available throughout Valencia Airport (the first 30 minutes of which are free of charge). Public telephones are also available in the terminal. Valencia Airport has arrangements and facilities in place to ensure optimum accessibility for disabled travellers, including access ramps, lifts and Braille signage. Designated parking spaces for disabled travellers are available in the car parks. Any passengers who may require additional assistance are advised to contact their airline before travelling. 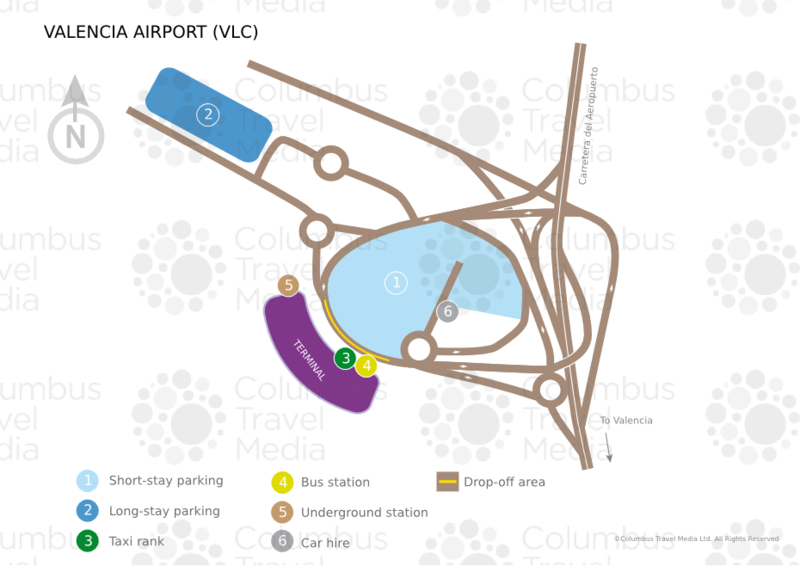 Both short- and long-term car parking is available at Valencia Airport. The short-term P1 car park provides 400 spaces and is directly opposite the terminal building, while the long-term car park is a little further from the terminal, but still within walking distance. Car hire companies at Valencia Airport include: Avis, Enterprise, Europcar, Sixt, Goldcar and Hertz. The car hire pick-up area is situated in the main car park opposite the terminal building.